The first film show in China was in Shanghai, 11 August 1896, at the Hsu Gardens, but details are lacking. In July 1897 James Ricalton, a school teacher turned professional photographer hailing from Maplewood, New Jersey, presented a programme of Edison films at the Tien Hua Tea Garden, Shanghai, including Tsar Nikolas II visiting Paris and the dancers Annabelle and Little Egypt. Ricalton had first worked for Edison in 1888, and in 1891 joined the renowned photographic firm of Underwood & Underwood. He took several films of local scenes in Hong Kong, Shanghai and Canton, some of which appear in the 1898 Edison catalogue. He may have undertaken further film shows in 1898, before continuing as a photographer in China for Underwood & Underwood to record the Boxer rebellion of 1900. He then journeyed around the world as a photographer, covering the Delhi Durbar of 1902/3 and the Russo-Japanese war of 1904/5, and wrote two illustrated books on his experiences, China through the Stereoscope (1902) and India through the Stereoscope (1907). 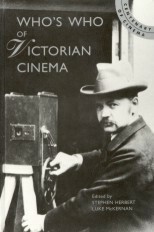 He kept some association with the motion picture world, however, being recorded as working for Edison once again in 1912.